Even at more than 10 years old, the Warhammer 40,000: Dawn of War franchise still has a strong, passionate player base, and we at Relic would like to celebrate and show our thanks! From September 24 10AM PDT through to September 27 1PM PDT, Dawn of War I and II, plus all expansions, are free to play on Steam. As well, for new recruits, or veterans looking to complete their collection, both titles and all expansions are 75% off until September 28 at 10AM PDT. As a special thank you to all our loyal players, and as a welcome to anyone new to the franchise, we’ve also added some bonuses to DoW I and II. •	The Temple of Cyrene is a brand new, official multiplayer map we’re adding into the Dawn of War I rotation. This map will be playable in DoW I, as well as the Dark Crusade and Soulstorm expansions. The Temple of Cyrene sits on the blasted landscape of a world scoured clean by the Exterminatus of the Imperial Inquisition. Homeworld of Gabriel Angelos, Cyrene is now a ghost-world of ruined cities and ashen fields. Fight for supremacy amidst the remains of Cyrene’s once-mighty temples. Claim the three critical locations at the heart of the ruins or drive into enemy bases and deliver annihilation. •	In Dawn of War II, we’re giving away four free sets of Wargear; The Vanguard, Sniper, Sternguard, and Destroyer, to equip in the main campaign that were previously only available as pre-order DLC, or as rare loot drops. Now everyone will be able to equip items like the Veteran’s Grenades, Blade of Ulyus, Armor of the Destroyer, and many more to complete your sets! 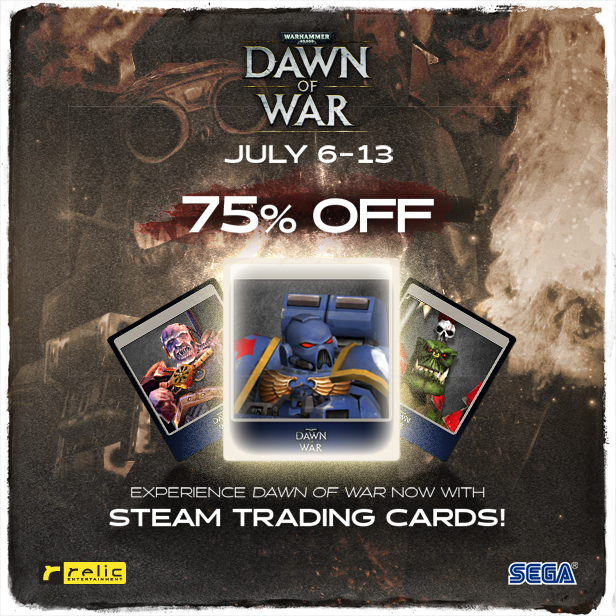 We’re very pleased to announce that one of Relic Entertainment’s flagship titles, Warhammer 40,000: Dawn of War II has introduced Steam Trading Cards to the experience, and is having a massive sale to celebrate! As players take up arms in the campaign or multiplayer modes, they will unlock Steam Trading Cards, chat emoticons, Steam profile backgrounds, and more! To celebrate, Dawn of War II will be on sale for 75% off until July 20 at 10AM PST. We can’t wait to usher in a new generation of Dawn of War players, as well as show veterans some love with new unlockables. Warhammer 40,000: Dawn of War has been updated to include Steam Trading Cards to enhance your experience! As players explore through the campaign and multiplayer modes they’ll unlock Trading Cards along with new badges, chat emoticons, and Steam profile backgrounds! 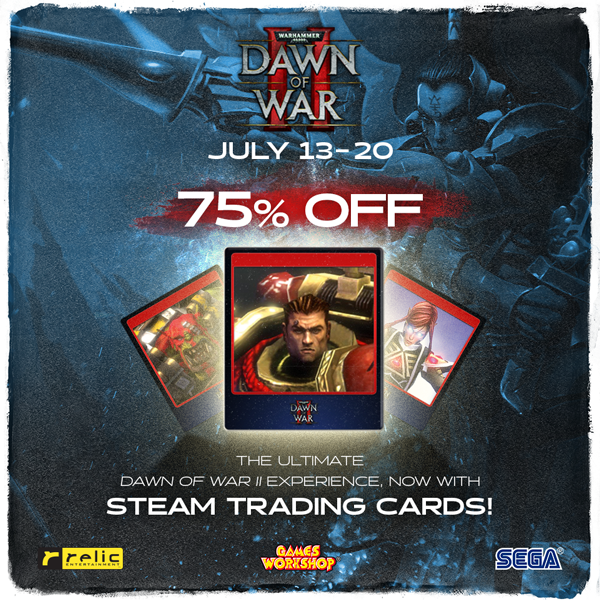 To celebrate, Dawn of War will be 75% off until July 13th at 10AM PST. In Warhammer 40,000: Space Marine players take on the role of Captain Titus, Space Marine of the Ultramarines chapter and seasoned battle veteran. Facing a horde of countless Orks, you must protect the Imperial Forge World, one of the planet-sized factories where the war machines deployed for the never ending battle for humanity are created. The Space Marine Collection includes all available DLC, including the Chaos Unleashed map pack, where you take the role of the Chaos Space Marines in a 4 player Co-op mode, and Dreadnought, allowing you to obliterate your friends in multiplayer as the heavily armored 12-foot tall Dreadnought. With additional maps, modes, character skins, and more, the Space Marine Collection is the ultimate Ork-stomping experience. As an added bonus, we’ve introduced Steam Trading Cards to Space Marine! Throughout your journey you can unlock 15 trading cards, as well as badges, Steam backgrounds, and more! This weekend new troops are being sent to the Eastern Front as <em>Company of Heroes 2</em> is having its first ever <a title="Steam Free Weekend" href="http://store.steampowered.com/app/231430/">Steam Free Weekend</a>. Starting today and running until Sunday January 19th all Steam members will be able to play <em>Company of Heroes 2</em> for free. No conditions, no catches, it’s the full Company of Heroes 2 experience and it’s a click away for all Steam members. Players will be able to experience the full single-player campaign, the single player and co-op Theater of War experience in Operation Barbarossa and of course the <em>CoH2</em> multiplayer. Veterans of <em>CoH2</em> will not only have new allies and enemies to faceoff with in multiplayer this weekend, but as an additional bonus we are unlocking all of the game’s paid DLC commanders for four days of play. So if there’s been a Commander you’ve wanted to try on the battlefield then this is your chance. As an additional bonus multiplayer automatch games will be awarding ten times the experience all weekend. Yup, that’s right 10x XP all weekend long for any automatch game. Have a friend who you think would love<em> Company of Heroes 2</em>? This is the weekend to get them playing the game. And as an added bonus the game will be <a title="Company of Heroes 2 on Steam" href="http://store.steampowered.com/app/231430/">66% off on Steam</a>, allowing everyone who loves playing it for free to keep it for a very low price. Welcome to <em>Company of Heroes 2</em>, we’ll see you on the front lines.